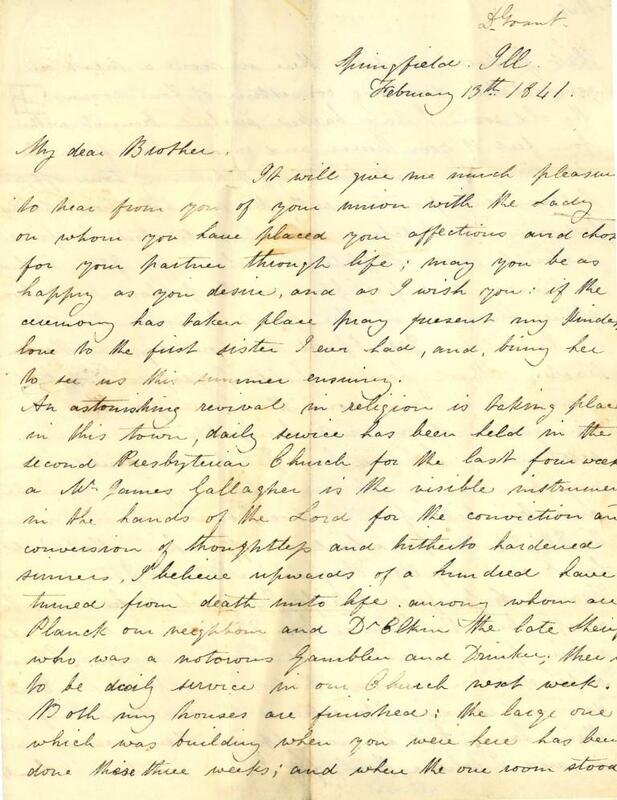 Letters recently acquired by the Sangamon Valley Collection at Lincoln Library show how one Springfield widow struggled to make a living in the 1840s. The story of Dorothea Grant also illustrates how some employers treated their African-American servants at the time. It will give me much pleasure to hear from you of your union with the lady on whom you have placed your affections and chosen for your partner through life; may you be as happy as you desire and as I wish you. If the ceremony has taken place pray present my kindest love to the first sister I ever had and, bring her to see us this summer ensuing. An astounding revival in religion is taking place in this town, daily service has been held in the Second Presbyterian Church for the last four weeks. A Mr. James Gallagher is the visible instrument in the hands of the Lord for the conviction and conversion of thoughtless and hitherto hardened sinners, I believe upwards of a hundred have turned from death unto life among whom are Planck, our neighbor and Dr. Elkin, the late sheriff who was a notorious gambler and drinker. There is to be daily service in our church next week. Both my houses are furnished; the large one which was building when you were here has been done these three weeks; and where the one room stood that Jackson occupied there is now a neat and comfortable dwelling consisting of four rooms. The old room I had backed six feet brought within four feet of your house and raised three feet. The old shingling, weatherboarding and plastering torn off and that room incorporated with the new addition of two bedrooms and a kitchen. Stuart contracted to find materials and complete the whole for $335 including a chimney and fire place in the parlour and two stove flues one in the front bedroom, the other in the kitchen. $100 I paid him on signing the contract. Stuart however holds possession of both houses and I am none the better for them in consequence of our not being able to come to a settlement. I paid him $50 for the double chimneys in the larger house when they were finished and his bill for the two houses now amounts to $1,424.50 for which we offer him, that is Mr. Lamb and myself, Ferguson’s note for $500 and Francis & Sanford’s note for $400 which he agrees to accept but the balance being $524.50 he insists upon being paid in cash which I cannot raise. I had depended that much from the Van Dorens promising to release the northern half of their land, but it now appears they cannot raise it and I believe them; for I have wanted Mr. Lamb to borrow that sum for me but he says there is none to be had, the Bank does no business and all those persons who had money lent it. The distress for money is great indeed. I must foreclose the mortgage on Van Doren’s land the ensuing court in March but it will be much against my inclination; cannot you take up the mortgage? The land is worth three times the amount and the interest paid on the money, 12 percent. You could pay me by an order on Mr. Lamb who you know is only giving you ten percent or if you will not do that, cannot you $500 at six months, at the end of which (torn page) the land would be sold and I would (torn page). Do my dear brother consider favorably my petition and let me hear from you in answer to this immediately as court commences the first Monday in March. I am also told that Stuart can if he chooses to sue me, set aside the contract and make a new bill and thereby gain 4 or 5 hundred more as the work he has done for me is undoubtedly lower than some of the other buildings charge, and a jury here would certainly award him whatever he would charge. Edward is improving, he desires his love to you as does Henrietta who is going to school. Mr. & Mrs. Canfield also desire to be remembered to you. Dorothea Grant, born on the island of Jamaica about 1808, apparently was the widow of John Henry Grant; no other information is available about him. Dorothea Grant lived in Springfield in the late 1830s and 1840s. The property referred to in this letter seems to have been on the northwest corner of what today is Fifth and Jefferson streets. In addition to home rentals, Grant took in boarders. In 1839, a “Mrs. 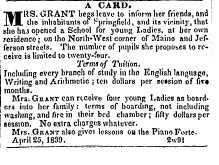 Grant,” presumably the same woman, advertised in the Illinois State Journal that she was opening a “School for young Ladies” in her home. She proposed to accept 24 students, including four who would live in her home. They were to pay $10 for a five-month-long curriculum “including every branch of study in the English language, Writing and Arithmetic.” “Mrs. Grant also gives lessons on the Piano Forte,” the ad said. The school probably was unsuccessful; there are no other references to it in Springfield newspapers, and the advertisement was published only in the spring of 1839. Meanwhile, in 1843, Grant was cited for “unchristian conduct” by her church, Second Presbyterian, for whipping an African-American servant girl. With regard to whipping the girl with a cow-hide, Mrs. Grant stated that she had been in the habit of correcting the girl when she thought her conduct required it, and did not think she was correcting her any ore severely than she had done at other times; she was not aware at the time that any marks were caused on her body by this whipping & can account for it only from its being done with a different instrument from what she had formerly used, the severe affect of which she was unconscious. Mrs. Grant acknowledges that the whipping was too severe and not accompanied with that mercy which the Christian (should?) always exercise … (S)he is sincerely sorry, and asks the forgiveness of her feollow members as she does also of her God. 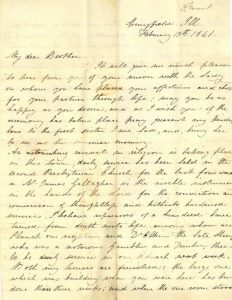 The letter’s addressee, Grant’s brother, was Marcus William Stamp (1804-52). He is buried in Mount Vernon, Ohio. James Lamb (1800-73) was a prosperous merchant and pork packer and apparently a friend and business associate of Dorothea Grant. Jacob Planck (1804-67) was a shoemaker and leather worker whose shop was on North Fifth Street near Grant’s property. Garrett Elkin (1797-1892), a physician from Kentucky, served six years as Sangamon County sheriff; in a political dispute, he once took a horsewhip to a newspaper editor. He died in Iowa. James Gallaher (1792-1853) was a Presbyterian minister and professor in Tennessee, Ohio and Missouri; he served as chaplain of the U.S. House of Representatives in 1852-53. His last name is misspelled in Grant’s letter. Edward and Henrietta were Dorothea Grant’s children. Dorothea Grant’s finances apparently did not improve. More than two years later, Lamb wrote another letter asking Stamp to help Grant. … Owing to the character of her tenants and the greatly reduced rent of dwelling houses within the past 12 or 18 months her expenses have exceeded her income by 7 to 800 dollars. She owes perhaps half the above amount to myself which I trust will give her no uneasiness. The remainder due to other merchants and traders of this place and will perhaps have to be paid shortly as it was all due in January last. Mr. Moffitt owe her I think about 2 to 250$ which can be made available in the payment of her debts. This will leave her from four to five hundred in debt, more than she has immediate means of paying. I think with an allowance of 250 or three hundred per year for two or three years she can get out of debt and perhaps at the expiration of the time, her property may improve so as to make her to live from the rents of her houses. In summing up her liabilities I have not included the note of 500$ which is due to you. The 1850 U.S. Census finds Dorothea (“Dorotha”) Grant in Chillicothe, Ohio. In 1860, the Census lists her (“D. Grant”) as living in St. Joseph, Mo., with her son Edward. When and where she died is unknown. Hat tip: Thanks to Curtis Mann, head of the Sangamon Valley Collection at Lincoln Library, who drew our attention to the Grant letters and did most of the research into Grant and her life in Springfield. This entry was posted in African Americans, Business, Early residents, Women. Bookmark the permalink.